Targa Florio (R6, 1971 cm) - ost rok. Od 1952 roku zbudowano 14 egzemplarzy tego modelu. Sebring (R6, 1971 cm) - nowy model. Powstały tylko 3 sztuki z 2 drzwiowymi, 2 miejscowymi nadwoziami typu Sports. Frazer-Nash factory at Isleworth, with the latest Targa Florio model Frazer-Nash in the foreground. Frazer-Nash Sebring Sports. Developed from the Mark II Competition model, this model is powered by the 2-litre Bristol engine and has a light alloy all-enveloping body. It took its name from the 12-hour endurance race at Sebring, USA, which had been won by Frazer-Nash in 1952. At the wheel in the version shown is W. H. Aldington who, together with his brother, took over control of production of the chain-drive Frazer-Nash in the late "twenties". 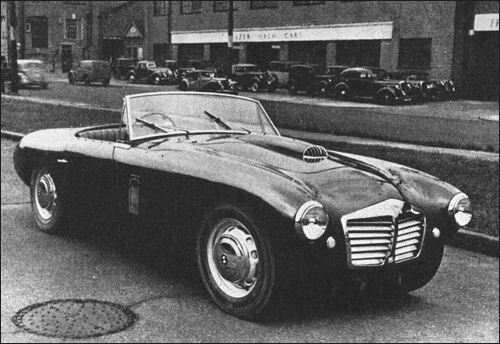 Sebring of 1954 took over from the Le Mans rep as a road / competition car. Chassis and mechanics follow the old recipe De Dion rear end, 1971cc Bristol engine, and centre lock wire wheels. Full width sports body similar to Fast Tourer but with new shape grille with horizontal bars. Fixed head Coupé, originally designed for Le Mans, has full width body with straight through wing line, and grille design as on Sebring. Bristol engine in 100 or 140 bhp spec. Total of 14 built.